In a medium sized frying pan, add olive oil, garlic, spices and salt. Sauté for 2 mins until garlic is slightly browned and spices are toasted. Add carrots and continue to sauté for 5 minutes on medium heat. Remove from heat and place carrots in a bowl. Add tahini and stir thoroughly. 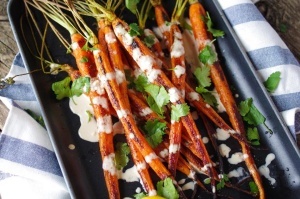 Transfer carrots to an oven proof dish, and oven roast for 15-20 minutes until cooked through and crisp on the outside. Drizzle with a little more tahini and sprinkle with toasted sesame seeds and fresh parsley leaves. Serve alongside your favourite protein.